Although the flight was fairly filled up we where lucky enough to have a aisle to ourself so Molly-May could have her own Seat. 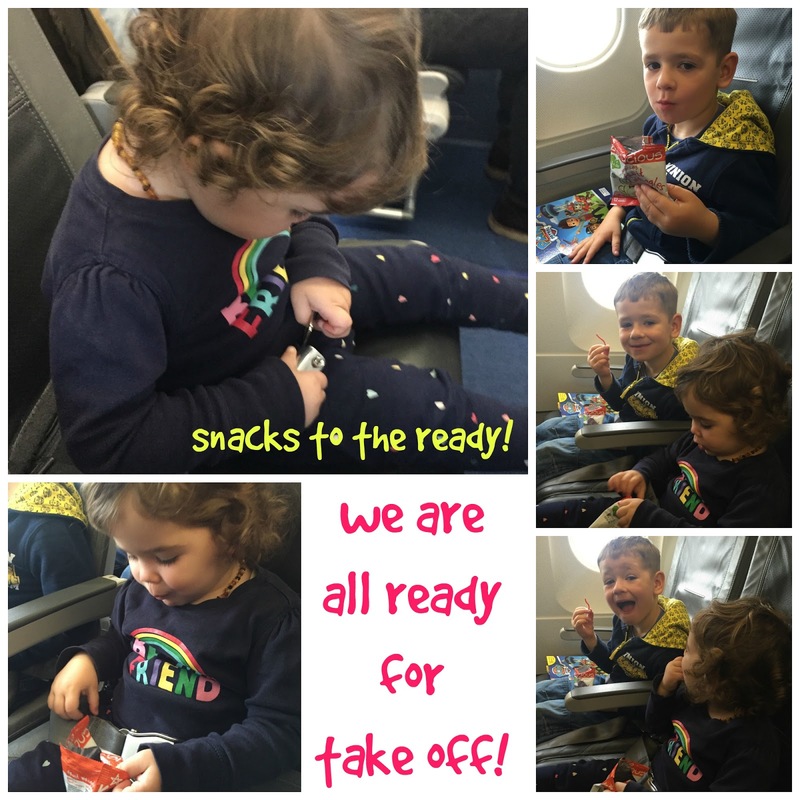 When i travel with both children i make sure i pack a bag with toys (nothing with small bits they just get lost) a scribble board where the pen is attached to it so it cant get lost and plenty of snacks, so when Kiddylicious ask me if i would like to try out some of their new snack ranges it was a no brainer and was delighted when the parcel with lots of Kiddylicious goodies arrived through the door a few days later. We already reviewed the Kiddylicious Wafers a while back and loved them so i was certain both kids will enjoy helping me with the testing and tasting of all the snacks! A few days later with suitcases packed, Toy Bag all filled up and the Kiddylicious Snacks securely stored in the changing bag we made our way to the airport. I always try to enter the plane last so the time spend sitting down in the plane is cut short for another 15 minutes. 100% pure fruit whizzed up to make it all frothy, then set into delicious bubbly bites that melt as soon as you put them on your tongue – how cool is that! They come in 3 different flavours: Blackcurrant and Apple, Banana, Mango & Passion Fruit and Strawberry and Banana. Finn and MM love those and there favourite is the Strawberry and Banana flavour which is funny considering that Finn would never eat a banana in its normal shape! Then we have the Fruit Wrigglers who are made from the finest, juiciest fruit that has been cooked, pureéd and whizzed to magically form wonderfully tasty wriggles – they can be twisted or twiddled by little fingers – great fun! Those where a instant hit with Finnster and he loves them all and things they look like funny worms! MM preferred other snacks from the range more which Finn doesn’t mind because then there is more for him. The Crispie Tiddlers are super cute fish shaped little snacks made from real fruit and fruit juice, puréed and mixed with crispy little rice pieces, each bag has no added sugar and contributes to more than 1 of your 5 a day. They come in 2 different flavours: Raspberry and Banana. Both the kids loved those and there favourite was the Raspberry one they even give out a tiny little pop feeling in your mouth when you let them melt on your tongue. And last but not least (my absolute favourite Kiddylicious snack) so tasty in fact i don’t share it with the kids,….well i did offer it to them but they rather choose the other bags so the Apple Crisps are now know as Mummy Snack which works for me! For the crisps Kiddylicious select the finest vegetables and friuts, carefully remove any stalks, cores or skins (where appropriate), then slice and crisp in a really special way to create delicious, crunchy, melt-in-your-mouth snacks. The Crisps come in 3 flavours: Apples Crisps, Banana Bites and Pineapple Snacks. I am yet to try the Banana or Pineapple flavour but i love the Apple crisps and they are my snack to go when i am in the car or get hungry but its not quite dinner time yet. They are a very healthy alternative for snacking purposes which works well for me. 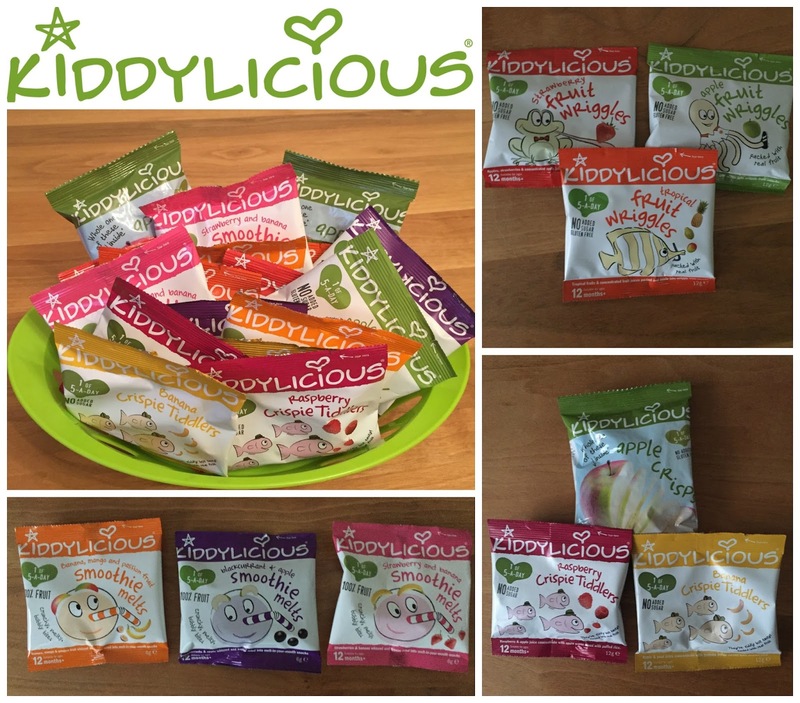 In each little bag of the Kiddylicious range there is at least 1 of the recommended 5 fruit or veg portions a day – just the thing to pop in your bag for when out and about, perfect for lunchboxes and also really great for fruity toppings on cakes and home baking. The kids also have the snack packs for a little health after school snack in the car on the way home and they become a big favourite in our weekly food shop! Disclaimer: I have been send some Kiddylicious Snacks for reviewing purposes, but all thoughts and opinions are mine.